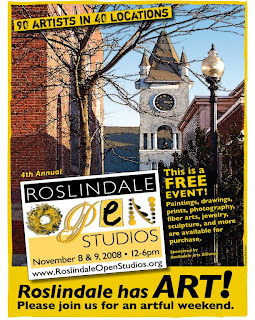 This weekend I am excited to announce is the Roslindale Open Studios taking place all over Roslindale. Local artists open the doors to their workplaces and homes, businesses and restaurants host shows/events and out-of-town artists will be at a large group show in Roslindale Village. There will be over 90 artists in 40 locations, including painters, photographers, printmakers, fiber artists, potters, jewelers and more participating this year. One special event is the Opening Reception-Preview Show which will be on Friday, November 7 at 6:30 p.m. at the Longfellow House, 885 South Street. The public is invited to meet artists and preview work from home studios and local businesses. I will be showing at 96 Farquhar St, stop by and say hi!